In order to start construction the first thing that needs to be done is to determine the characteristics of the available water. The height of the water source and the available water flow needs to be determined. Once that is done, the right equipment can be selected. There are a huge number of equipment manufacturers and distributors available. Internet search engines make the selection process simple although time consuming. After the equipment is stock pipe line, power house and the electrical system can be designed. Many variables exist in equipment and location so each facility will have it's own, unique, set of parameters to consider. In non-rural areas there may be regulations prohibiting self-generation facilities. Hydroelectric electricity needs a steady source of water. The power output of even a small power plant depends on both the pressure and volumetric flow of water. The higher the pressure the less water flow is needed, and inversely the lower the pressure the more water flow is required. Hydro-power equipment is normally divided into three groups, high pressure, medium pressure and flow rates are low, medium and high. High pressure system include a pipe line (pen-stock) and usually a "Pelton" type wheel. A Pelton wheel is an impact driven device. A Pelton wheel has buckets which the high pressure water stream strikes causing it to rotate which turns the attached generator producing electricity. Pelton wheels are normally used where the height of the water drop exceeds 70 meters. Pelton wheels are 80.90% efficient. A Pelton wheel turbine controls generator output by restricting water flow from a high pressure nozzle. Medium pressure hydroelectric generators use either Kaplan, Francis or Turgo turbines. Francis and Kaplan wheels are called reactive devices because the are driven by water passing over them. These turbines are used from 10-70 meters water drop. They use what are called "wicket gates" to control the water entering the turbine. They are somewhere in the neighborhood of 90% efficient in converting the potential energy of the water to shaft rotational energy supplied to the generator. Some of the equipment used for low pressure systems include a reverse Archimedes screw, a water wheel or a bulb turbine set in a river. A paddle wheel in a river can produce significant electrical energy. These types of hydroelectric generators can produce energy for water drops well under 10 meters. Efficiencies range from 65% to 85%. Generally the higher the water drop (head pressure) is the lower the required water volume flow is for the same power output. The equation that can be used to model a hydroelectric plant can be expressed as P=9.8I*Q*h*E where P is the output power in kw; Q is the flow rate in cubic meters per second, h is the drop height in meters and E is the efficiency in percentage. There are several other equations that are important. Water velocity at the turbine can be calculated by V=sqrt(2*g*h)_, where g is the gravitational constant (9.81 meters! sec"?2) and h is again the height of the water drop in meters. Then the pen-stock pipe area is A=Q/V. From that equation the diameter of the pen-stock pipe is D=sqrt(4"A/3.1415). These equations will now be used to model three hydroelectric projects, a high pressure system using a Pelton wheel, a medium pressure system with a Francis wheel and a low pressure system with a reverse Archimedes wheel. The assumptions for the high pressure system are that the desired output should be 514W and that the height of the water source is at lSO meters. The efficiency is conservatively set at 75%. Calculating for the volume ?ow rate, Q=5/(9.81 * l50*.75), gives .0045 cubic meters/sec, 4.5 liters/sec, 272 liters/minute. The water velocity at the turbine wheel is V=sqrt(2*9.8l*l50), gives 54 meters/second. The pipe area calculation gives A=.? )045f54, or D0008 square meters, pipe diameter is D=sqrt(4*.00008/3.1415), or .010 meters, l cm. This l cm opening is the diameter of the power nozzle supplying high pressure water to the Pelton turbine wheel - A pen-stock pipe normally brings the water from the source so the power plant. Although only a l cm opening is theoretically required to produce the desired power it is not practical to run a pipe that size from the source. As the diameter of a pipe is reduced the water velocity increases, as the velocity increases so do the friction losses. In order to maintain the flow rate the pen-stock diameter must be increased to reduce the friction losses. To keep the friction losses below 10% the pen-stock diameter must be 7.5-I0 cm. This is calculated to keep the water velocity in the pipe at .8-1.5 meterslsecond. Often a designer will size the pen-stock in sections so that the upper third of the pipe is three times the diameter of the lower third and the middle third section is twice the diameter of the lower third. This is also done to reduce the pipe friction and improve water flow and efficiency. For a medium pressure system a Francis wheel is considered, 5lrW output, water height is 40 meters, efficiency again at 75%. Calculating for ?ow rate Q=5/(9.81 *4O*.75) gives .01 7cubic meters/sec, l7 liters/sec, 1019 liters/min. Velocity at the turbine wheel is V==sqrt(2*9.81*4O) or 28 meters /sec. The pipe area calculation gives A=.0l7/28 or .0006 square meters and a pipe diameter of D= sqit(4*.0006/3.1415) or about 2.8 cm. As before this is the size of the opening leading to the Francis wheel. In order to reduce the velocity to .8 meters per second, in the pipe, to reduce friction losses the calculation is A=.Ol7/.8, then D=sqrt(4*A/3.1415) or 16.5 cm. For a low pressure system a reverse Archimedes wheel can be used to generate electrical power. The assumptions here are a 5kW output and a water height of 4 meters, efficiency 75%. 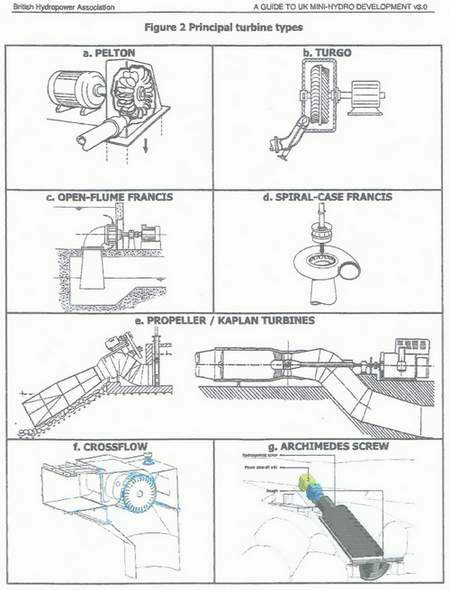 Flow rate is Q=5/(9.81 *4*.75) gives .17 cubic meters/sec, 10,000 liters/minute, water velocity at the turbine intake is 8.9 metersf sec and the pipe diameter calculates to 15.6 cm Because of the specifics of the Archimedes screw, it is an open pipe, and the requirements of a slow water velocity the size of the required pipe increases to 75-100 cm. The potential power that can be generated from a water resource can always be determined from the equation P=9.81*Q*h*E, the variables, constants and units are as described above. For example a water source at 80 meters with an available flow of .006 cubic meters/sec and an equipment efficiency of 80% could generate 3.5 kW. For high and medium pressure facilities obstructions at the intake site is always a problem. Floating debris can get into the pipe causing major problems at the turbine. A small dam and pool can be built which allows the inlet to be at some level below the water surface allowing debris to float by the inlet. Metal gradings and screens can be fabricated to allow debris move past the inlet. Since the 19605, many commercial energy producers and distributors have been required to pay for electrical power that is made available and pushed into the electrical distribution grid. Extra power produced by small scale hydroelectric plants can be supplied back to the grid producing income. There are some safety devices required to make this sort of system workable. At a bare minimum both a positive disconnect from the utility grid and a reverse power protection relay are required. Both of these are readily available. The positive disconnect is required to protect utility employes working during power outages and the reverse power relay protects the power plant equipment. The additional advantage of connecting to an existing power grid is that there is then no need for any control of the voltage and frequency of the hydroelectric generator. The grid sets the voltage and frequency and the generator just supplies a constant load to the grid, making the control circuitry much simpler. The picture/drawings of different hydro equipment are courtesy of ?www.british-hydro.org?